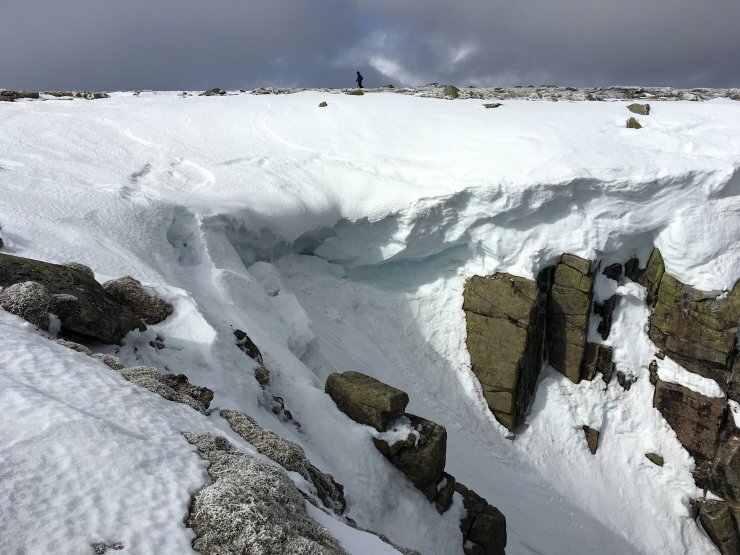 Well we’ve reached the last day of the 2018/2109 forecast season so I decided to finish where we started on the 14th December 2018 – In legendary Lochnagar. 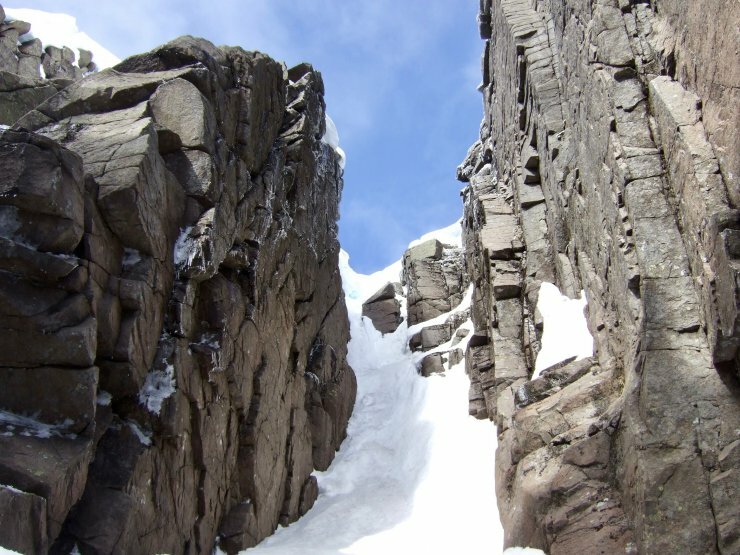 There’s nothing quite like standing in the corrie looking up at all the possible lines – Summer or Winter. It was quite windy in there today and the surface of the loch was choppy with the frequent gusts lifting the water into the air at times. 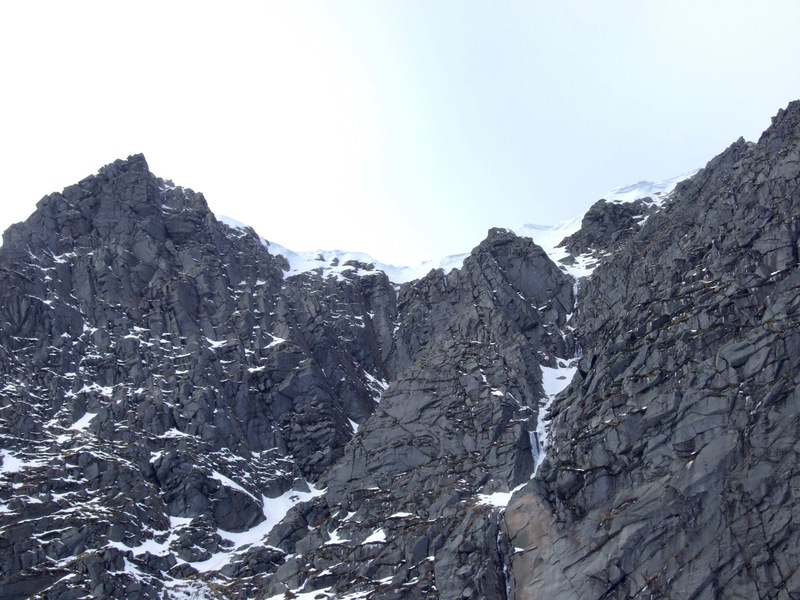 It had been cold overnight and the snow was firm – however it was apparent that during the thaw quite a bit of rockfall had occurred from the cliffs with new rocks peppering the snow. There’s a bit of cornice still hanging in there for when it gets properly warm. Which it wasn’t today – seriously cold on exposed skin in the strong winds at summit level. Black Spout, Left hand branch still has plenty of snow in it and the finish saves a little bit of fun for the end. A couple of guys who climbed up the Right hand finish reported neve all the way up, a little thin at the narrows, but still a good outing. They hadn’t had enough and were heading over to the Dubh Loch to see if they could get a few more metres of ascent in. 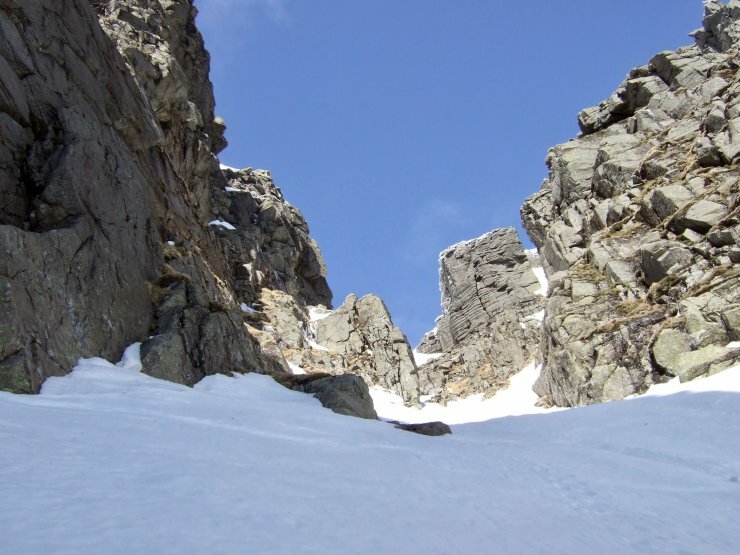 So we leave you with well bonded, patchy but very firm snow – it was front points and solid pick placements today – so no trips and slips please: The runouts are seriously rocky. 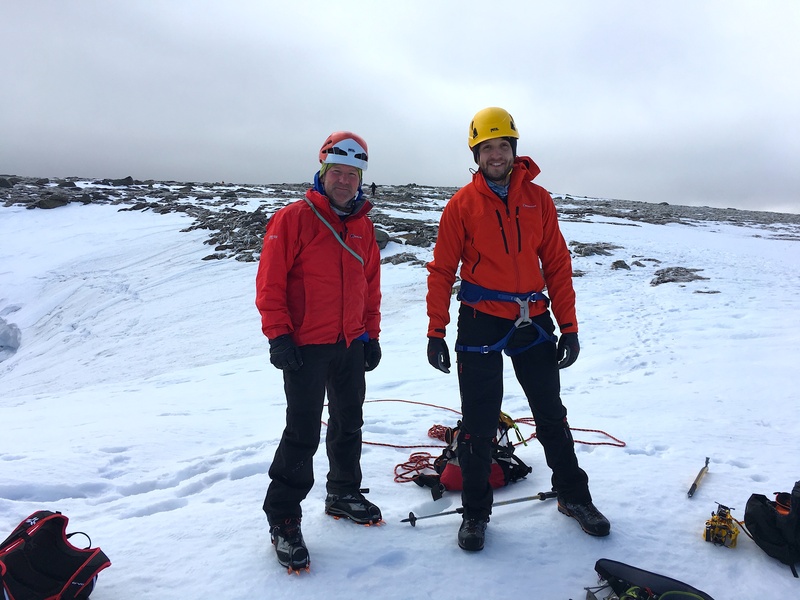 We receive a lot of support locally and we would like to give a massive ‘thank you’ to Police Scotland and Braemar Mountain Rescue Team for hosting us. 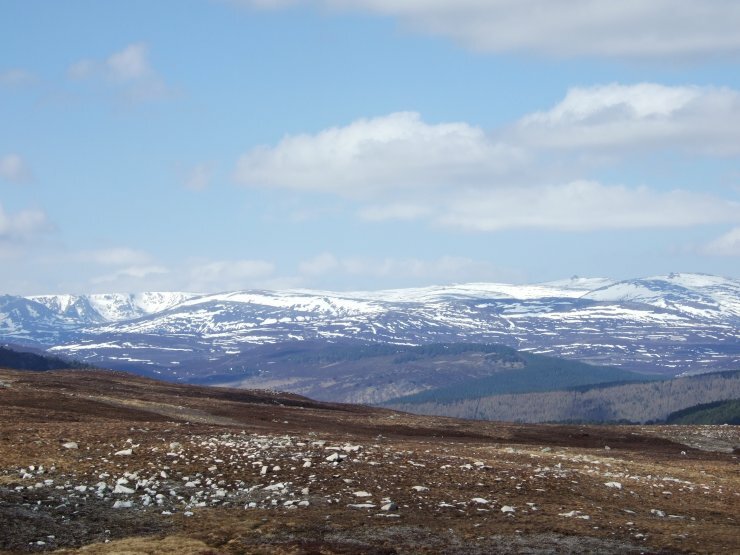 We receive huge support from Balmoral Estate, Glenshee Ski Centre and The National Trust for Scotland, Mar Lodge Estate – so thank you for making the job easier. As well as our fantastic national equipment sponsors, our local shop Braemar Mountain Sports has been brilliant again this year – Thanks Guys – always there when we need something! And thanks to all of you out there – We’ve met a few of you on the hill this year and it is always great to hear that the service has a positive impact on your mountain experiences. The feedback on the blog is much appreciated as well. So have a fantastic Summer and here’s to a snowy Winter for the 2019/2020 season. 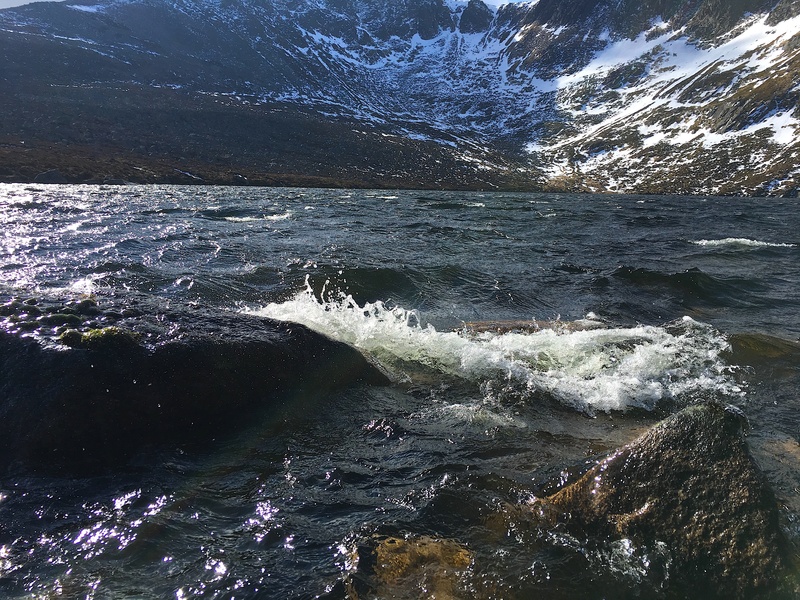 Choppy conditions on Lochnagar: The wind picked up through the day. 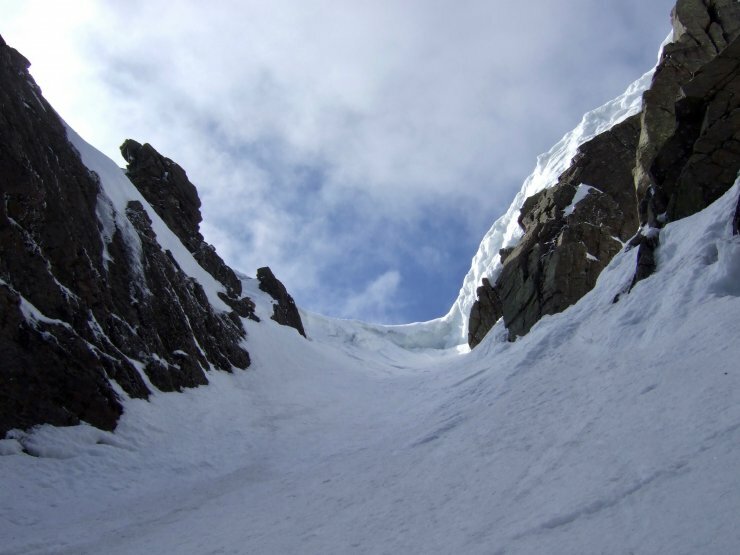 Some cornices hanging on in there at the top of the cliffs. More snow on Beinn a’Bhuird and Ben Avon. These two guys had just romped up Blackspout reporting good snow conditions. 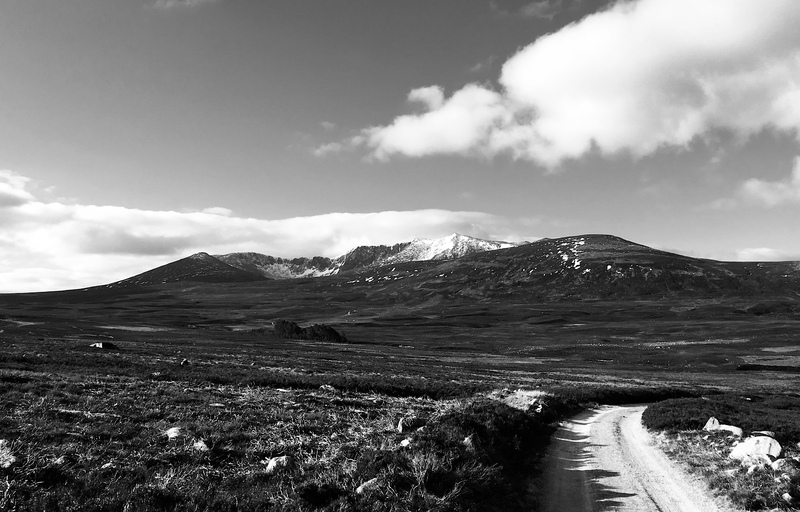 They were heading over to the Dubh Loch to grab some more metres of ascent…. Looking up Black Spout, Right Hand Finish. Looking up Black Spout, Left Hand Finish. Some of the easy gullies are still climbable with a mixture of good neve and some crud. Black Spout, Left Hand Branch still has a ‘fun’ finish. This is the last blog of the 2018/2019 season. Looking forward to being back in December. Thanks for the effort that has gone into the blog over the season. as someone who is basically trying to get into Lochnagar the whole winter they are a priceless resource! Perhaps (!) not the most interesting or inspiring conditions at times this winter so thanks for persevering with your physical efforts, and informative and helpful blog and photos. Thanks Roger, have a great Summer! Thanks Patrick. Let’s hope a season of grinding up and down the hills will keep me right. Just to echo the grateful thanks for your hard work. It really is appreciated. Thanks Phil, good to know people are reading the blogs. Really helpful blog for those of us stuck in the city…thanks.